The Greyhound is an ancient breeds, their history is about 5,000 years ago. The dog breeds is the fastest dog on the planet, and can run up to the speed forty-five miles per hour. Greyhound is an ancient breed, They are originates from Egypt, and his ancestry dates back to the 2900 B.C Ancient Egypt. In the late 1700s, when the U.S was being explored, many European immigrants brought this breed to them. This breed was first brought to America by the Spanish in the 1500s. The breed was registered with the AKC in 1885. 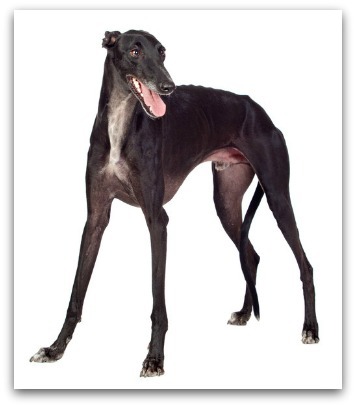 The Greyhound is a large and graceful dog, this breed is made for running. They is tall slender dog, and is well-muscled. The head is long and narrow, the eyes are dark color, and the ears are small and folded back. The hair is close tight and lying. The coat of this breed is weather resistant so baths will sparse. The coat is short and smooth, fine coat comes in all colors. Greyhound is a intelligent breed, so the effective training is so important and owner should be much more patience with this breed as this breed is so sensitive. The training should be consistent as this breed is a gentle handler. Retired racing dogs are not difficult to housebreak, once adopted, the dogs should learn all the details to living in a house. But they is a wonderful pets. Grooming a Greyhound is very easy, the coat is very short and short and sleek so it don't need much grooming. Just simply comb with a bristle brush or curry comb, and dry shampoo twice a week to keep it clean and sleek. Greyhound is an elegant sight, the breed is the fastest dog on the planet and can run up to the speed forty-five miles per hour. The breed is charming,loving,brave and Intelligent. The breed was been used long ago hunt stag, deer, fox and wild boar. The breeds of dogs is can gets along well with children, and good with other animals too.